The rodding shop at Mozal Aluminium, one of the core plant areas that has been upgraded to the new Allen-Bradley PowerFlex 755 AC Drives by Rockwell Automation. 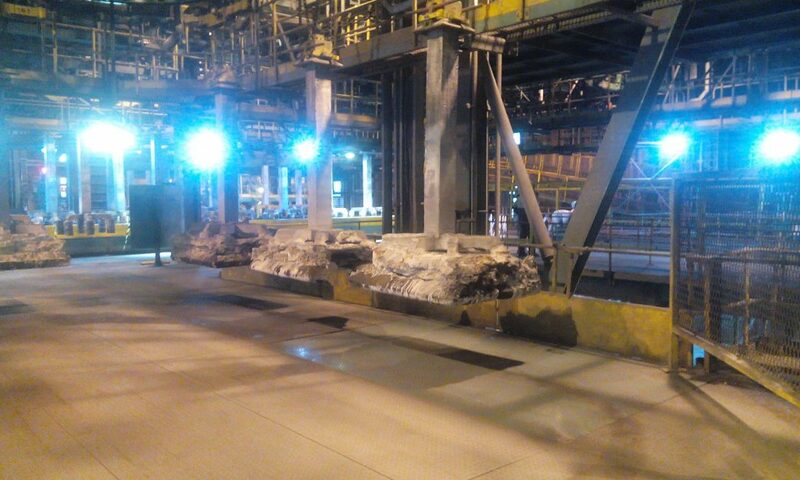 For over 20 years, Rockwell Automation 1336 Drives have delivered the drive control required across Mozal, an aluminium smelter near Maputo, Mozambique. Now the industrial automation leader is in the final phase of upgrading this plant-wide drive layer with its Allen-Bradley PowerFlex 755 AC Drives, bringing the feature-rich functionality of its flagship drive technology into Mozal’s production architecture. In addition to lowering risk of system downtime in the future and improving the plant’s long-term reliability, far greater process intelligence leading to massive gains in diagnostic capabilities; greater energy efficiency; and enhanced hardware and software support are among the benefits gained with this technology upgrade. With the PowerFlex 755’s intuitive HMI providing on-demand error reporting and diagnostic information, plant maintenance teams will have greater intelligence allowing them to fault-find faster and more efficiently and therefore reduce maintenance downtime. “The PowerFlex 755 delivers a high level of actionable intelligence at the fingertips of maintenance teams, allowing them to diagnose and correct process issues without having to search and consult technical literature to understand the meaning of errors, where they occur, and how they should be addressed,” explains Teboho Matlolane, Project Engineer, Rockwell Automation Sub-Saharan Africa. Other integrated functions, such as the drive’s TorqProve feature, enhances site safety on the many different crane and hoist applications across the smelter. Used to optimise control of load handling and lifting, this feature includes a continuous brake slip monitor that detects load slippages and will automatically hold and/or safely lower the load. The communications protocol needed to be able to keep the current systems running while ensuring that the drives are Connected Enterprise-ready on the EtherNet/IP standard. Beginning in 2014, with the scope of the migration numbering over 350 new drives, combined with the requirement of minimising any impact on operations, the migration has been done in four phases, each targeting one or more of the following plant areas: the Castline Tending Assemblies (CTAs); Trailer Loaders; Casthouse; Furnace Tending Assemblies (FTAs); Pot Line Tending Assemblies; Stacking and Transfer Cranes; and the Rodding Shop. There are many diverse positioning and hoisting machines in these plant areas, each requiring a unique solution. The migration continues to date and is scheduled to be completed in November 2020. Rockwell Automation implemented a planned migration within the plant’s maintenance schedule to keep plant shutdown to a minimum. This required precise communication, planning, preparation and execution between Mozal Aluminium, South32, Rockwell Automation and other third party service suppliers. In a streamlined and efficient installation and commissioning routine, Rockwell Automation, together with its local panel manufacturer Temoc Lda, assembled the new MCC buckets of the drives and ancillary hardware, testing each component individually, prior to integrating the new buckets into the existing panels. For Rockwell Automation, it is another demonstration of the company’s intelligent, Industry-4.0 hardware optimising production and operations efficiency in Africa’s mining and metals industries. (April 2019–Cape Town) A multi million rand merger deal between two of South Africa’s emerging companies has gone sour, after Managing Director for SA Today Ms. Sakeena Joosub, has suddenly had ‘cold-feet,’ about the deal. According to the agreement signed on Feb 7 2019, SA Today was to promote all pages of The Omar Abdulla Group on their relative websites and media platforms including News24, Media24, SA Today, and SA DAILY for a period of sixteen months for a sum of R12 million rand, with The Omar Abdulla Group selling the award winning binary codes of Bitcoin and The Abdulla Algorithm, which allows the purchase of likes and followers on social media, as a swap deal, with the payment of the R12 million rand as a loan to SA Today, payable over two years with a 17% market dividend per annul. ‘Abdulla does not see the need for consumers to buy online and use paypal as a payment method, instead he only wants clients to advertise on our platforms, without any shopping or ‘add to carts.’ grilled Ms. Joosub. Spokesperson for Footprints Filmworks, Mr. Anton Kruger says that The Omar Abdulla Group had purchased the company for the sole purpose of the award winning South African documentary; Footprints in South Africa. “We had purchased swap trade agreements with SA Today, so that we could market this documentary when it hits the public in October 2019. Footprints in South Africa is a documentary that encapsulates the past, present and future of South Africa.’ he looped. SA Businessman, Mr. Omar Abdulla who recently took a swipe at SA Today boss, Ms. Sakeena Joosub, broomed that Joosub often wrote her crime stories for the newspaper, under the influence of marijuana. However, before going to press Ms. Joosub said that their news portal will not in any way promote Abdulla’s brands, and that he should use other means for cross marketing. SA Today specializes in news, celebrity gossip and Vlogs whilst The Omar Abdulla group specializes in database promotion on all social media, film production and event planning. ‘It is a great loss the general public to see this deal not go through, and I’m sure both companies will be signing major deals within the year.’ echoed The Business Times. Seeing young people chase their dreams in the face of adversity never fails to warm our hearts. Siyabulela Mboyiya from Adelaide Eastern Cape happens to be one of those people. way to doing exactly that. Siyabulela says his mind was set on becoming a producer. once he saw how creative he was on a computer. His dreams took flight after many years taking part in auditions and competitions representing his home town. His passion is certainly paying off. of all his hardships and troubling times. “In those challenges, I learned lots of lessons. Xenee Lee , including financial aid to study further. Siyabulela is adjusting well in everything he does. His dedication allows him to grow more and more. He is very grateful for the love and care, he is also very grateful of his enemies because if they were not there he could have been weaker.